Stripes T-shirt is a wearable fashion trend that has made a major come back in 2017, and the best part is that you can get one in any color. From horizontal, diagonal, broad, broken, thin to mixed and match, these T-shirt designs have a cool, relaxed style that will showcase your swag yet polished enough to suit any fancy gathering. They are effortless yet express fashion style. To make a bold fashion statement consider wearing the following striped t-shirts. Even if you have never worn it, you must have seen the classic black and white striped T-shirt. It has a laid back look that complements any bottom be it a skirt, short or skinny jeans. Balance the neutral theme of this nautical inspired t-shirt by wearing colored pants or denim trouser. 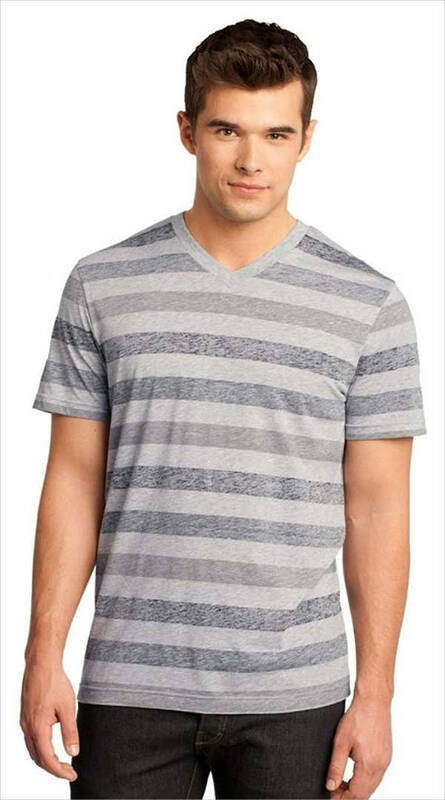 This V-neck vertical striped t-shirt for men works for all body types. The muted color will match all your favorite jeans and pants. The reverse stripe design prevents your t-shirt from looking plain and boring. 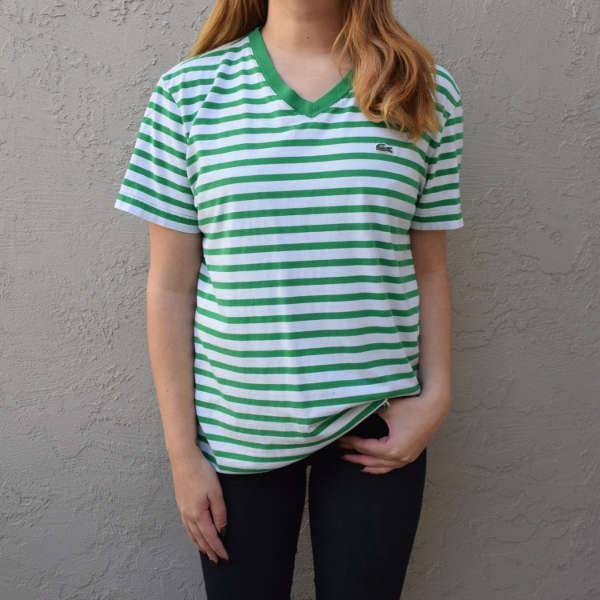 You can never have too many striped t-shirts because they come in so many different colors. 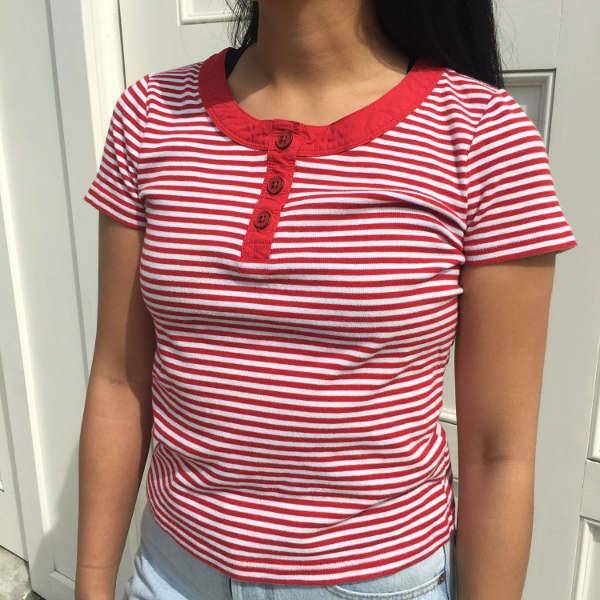 This red and white t-shirt has a vintage 1980s look which is perfect for ladies who loves retro styles. It is made using cotton material which is comfortable and has a button up element to give the top an edge. 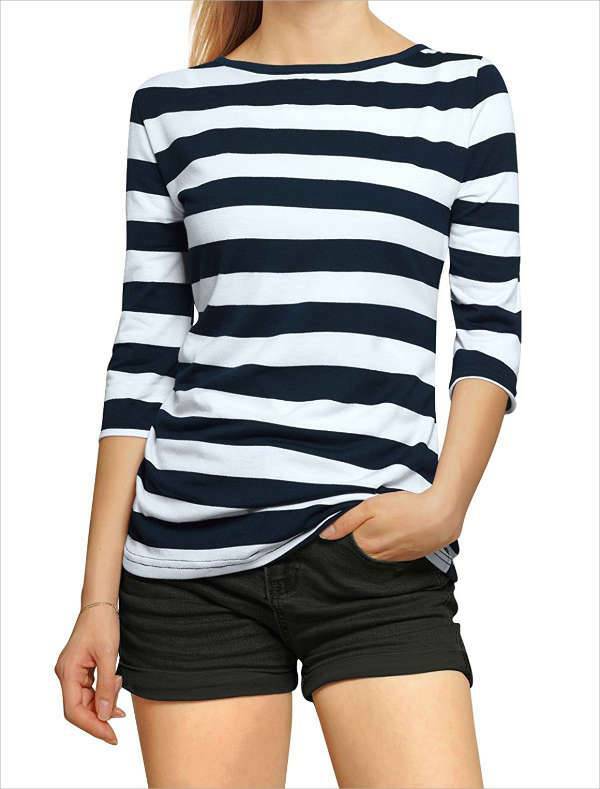 If you love striped t-shirts but prefer subtle colors, then this blue and white striped t-shirt is a must have for anyone who wants to look stylish. The half-length sleeves provide extra warmth for those cold days when you do not feel like wearing a jacket. This t-shirt is made using spandex material to ensure it fits different body sizes. 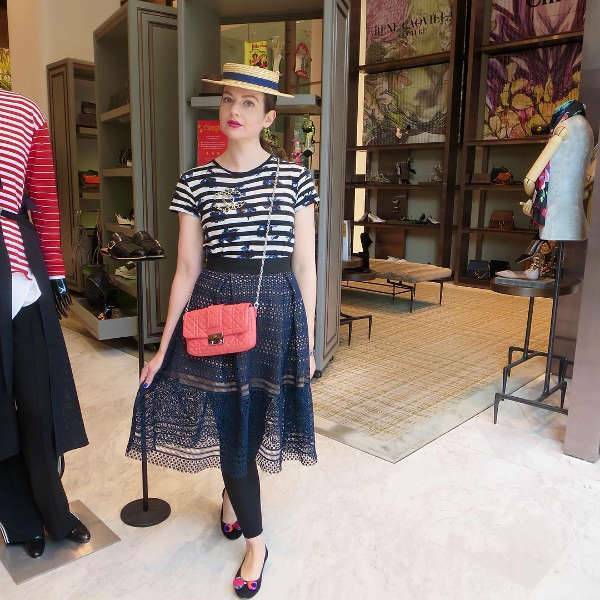 This striped t-shirts for women is chic yet classy. It features a faux leather panel on one shoulder which adds an edge to your summer look. The fabric will stretch depending on your body size. 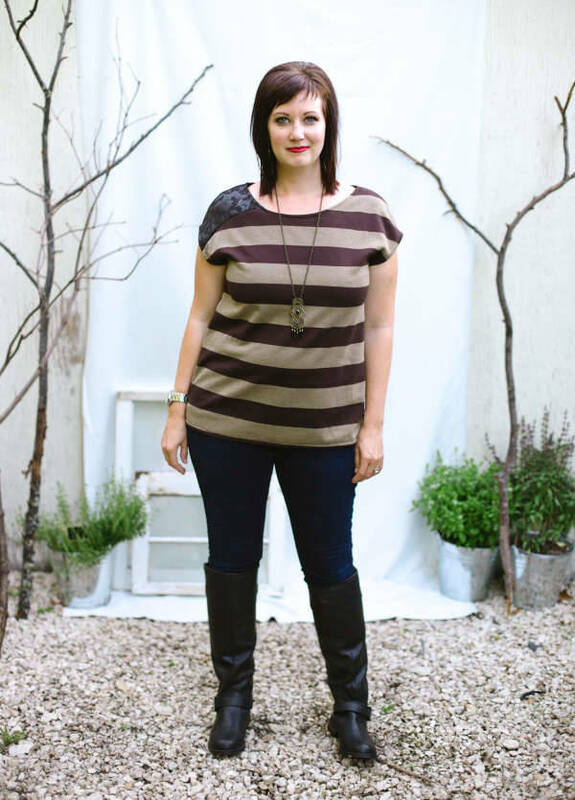 The top has a fit loose fit that goes well with skinny jeans, rugged denim shorts or tights. 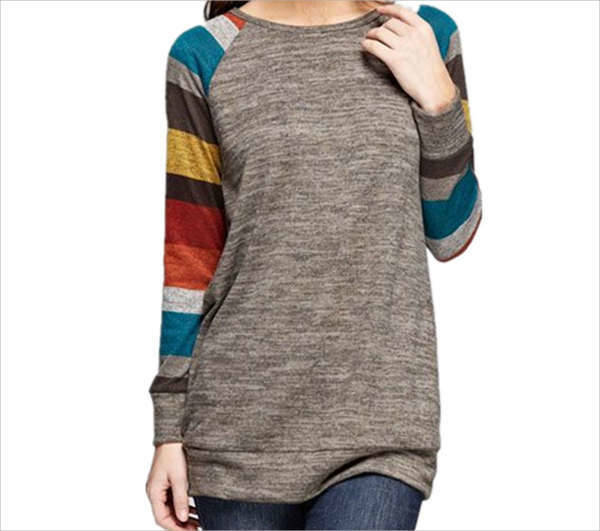 A t-shirt with stripes on the sleeve is great for people who want casual sports look. This shirt has a wide neckline which is perfect for layering and the bright color will make you noticeable in any crowd. Whether you want to improve your fashion style or give it as a gift for your female friend, this multicolor striped t-shirt is adorable. The different colors are only on the sleeves and have a long length that is ideal for wearing as a sweater top with leggings or tights. Vintage t-shirts will never go out of style, and anyone can wear them. A vintage striped t-shirt will showcase your throwback style and looks stunning with a sheer lace skirt and black leggings. A striped t-shirt in vibrant or muted shades has a youthful, carefree style that works year in year out. You can even get them as long sleeve t-shirts for those cold days when you still want to glam up your overall look. These striped t-shirts go beyond the classic black and white designs, so you are bound to get one that is comfortable and stylish for any occasion.